This week, I’ve been chipping away the residue, a couple of hours each day. Life has few things more sweet than finding a piece of paper headed ‘Action Plan for when Ofsted Arrive’, crumpling it up and tossing it with gay abandon and a smug cackle into the recycling box. I reckon there’s two or three more mornings’ work to go: the final item on the list says ‘Retire’. In classrooms around me, the other teachers have been preparing up for the new term. We have a brand new teacher starting, and she seems to have been in school all summer, setting up her classroom. 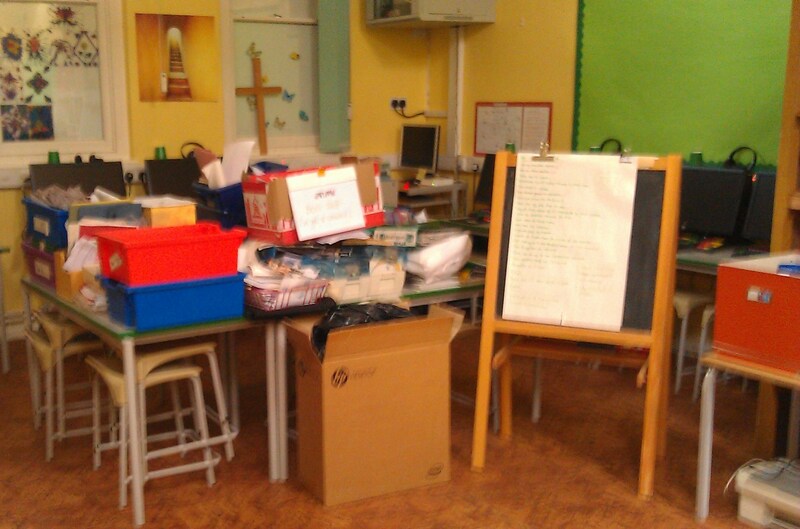 She’s in the very same room where I started at the school, though I took over from a teacher who had only been in the room a year and had left under a cloud of some sort: unwashed paint-pots still mouldering in the sink and drawers labelled ‘Lego’ but containing mouldy plasticene. It’s infuriating when you have to sort out someone else’s mess before getting on with the job. I remember Mrs Ocean-Child inheriting a room from a male teacher, so laid back that he was horizontal, and as idle as they come. He’s a head now, of course, having the chromosomes for it. Faced with a wall of cupboards and units stuffed with things that may or may not be useful, she adopted the splendid strategy of discarding anything that was older than her. It worked a treat. BrandNewTeacher inherited a classroom which was already well organised and has clearly worked hard to make it her own, ready for a lucky and lively bunch of five year olds. For those of us with a controlling disposition, setting up a classroom can be immensely satisfying. It’s your own little kingdom; set out, organised and labelled just how you like it. If only you didn’t have to let kids in to mess it up, things would be perfect. This particular room has a patio area outside, beyond which is a meadow. There are times when you can look out of the window and see foxes, muntjac deer and, occasionally, the odd peacock. It’s a great place to learn and a great place to teach. I hope that BrandNewTeacher enjoys it as much as I did. Looking at these rooms, though, does underline for me that I’ve made the right decision in stepping down. I just don’t have the energy to do it properly; or the temperament to do it improperly. Hmm, I wonder what that’s all about? An annoying piece of lazy journalism in The Guardian this week, making it even tougher for those poor souls who are reeling with a recent diagnosis of PD. The article was on the cheery subject of a recent report giving statistics about people who have chosen to go to Dignitas for Assisted Suicide. It looked at which countries people came from and so on. Then, it looked at what conditions those people had. The article then said: “The researchers found that neurological conditions such as Parkinson’s accounted for almost half of cases”. I reckon that anyone newly diagnosed would read this and conclude that vast amounts of people were finding life with Parkinson’s unbearable. I was so surprised that I looked at the report on which the article had been based. In fact, of the 908 medical conditions suffered by the 611 people in the study, just 37 had Parkinson’s, possibly as well as something else. The same number as had arthritis, in fact. Of all the neurological conditions listed, by far the highest reason is paralysis followed by Motor Neurone, then MS. So why highlight Parkinson’s, reinforcing the misconception to those poor souls diagnosed this week that their case is hopeless? Is it because it’s easier to spell? Or that celebrity cases have made it newsworthy? In fact, if you absolutely have to get a neurological condition, then Parkinson’s is a good choice. Medication is improving all the time and added to this is the bags of hope from the research projects which are striding towards a cure. On the question of which, Pa brought a cure that much nearer this week by booking a holiday from Warner’s, resulting in a mighty £17.95 , courtesy of the GiveAsYouLive scheme. Isn’t that brilliant?! Well done, Warner’s; well done, Pa. The link to GiveAsYouLive is here. If you install their toolbar, then it pops up to remind you when you’re about to buy online. Watch out, though, when buying from Amazon, because they’ve obviously put some sort of delay on the process. When I open up, it takes almost ten seconds before the tool bar pops up asking you if you want to turn on GiveAsYouLive. That’s quite long enough for you to start searching for the Columbo box set, or hot water bottle cover, or whatever and miss the toolbar opening.